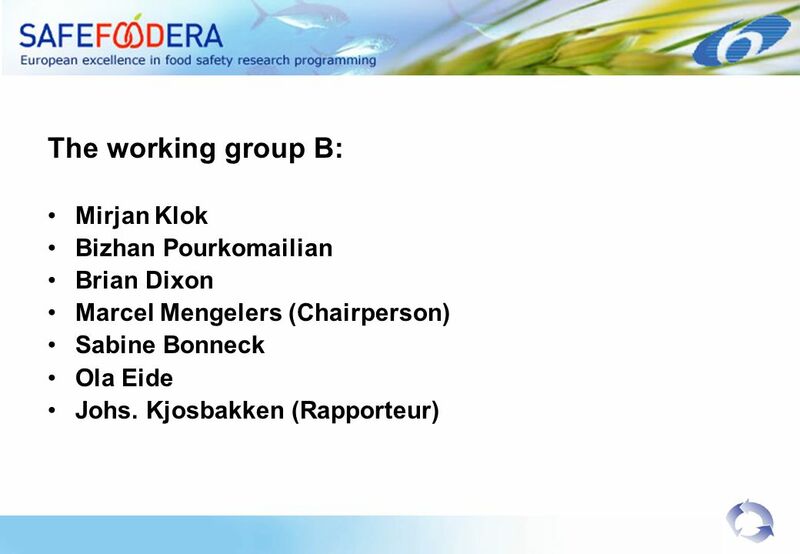 Report from Working Group B Stakeholder meeting in Ljubljana 8-9 February 2007. 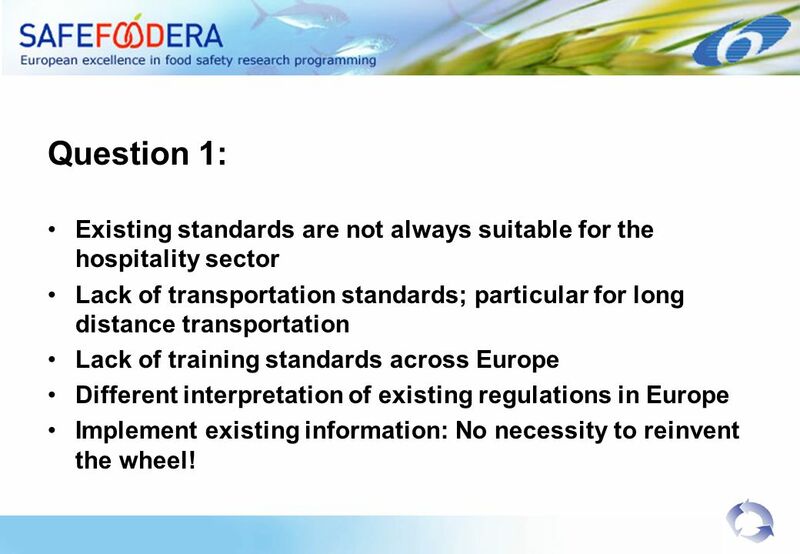 4 Question 1: Existing standards are not always suitable for the hospitality sector Lack of transportation standards; particular for long distance transportation Lack of training standards across Europe Different interpretation of existing regulations in Europe Implement existing information: No necessity to reinvent the wheel! 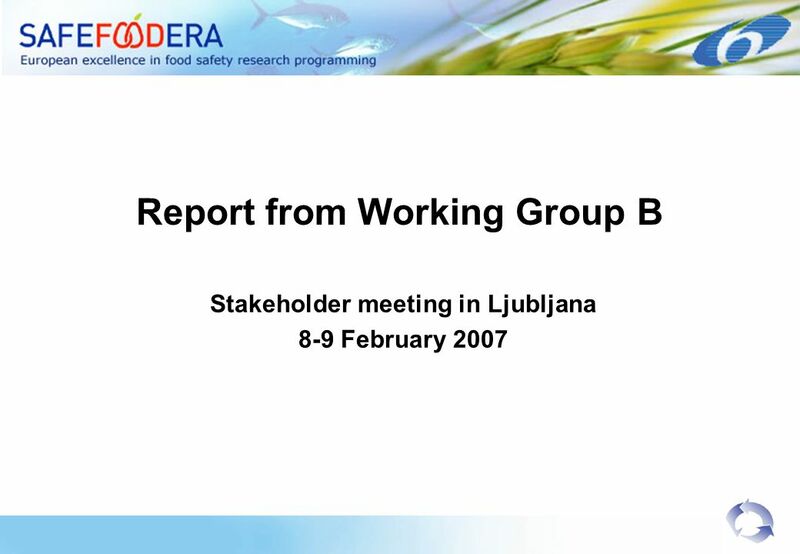 Download ppt "Report from Working Group B Stakeholder meeting in Ljubljana 8-9 February 2007." Report of Group A. 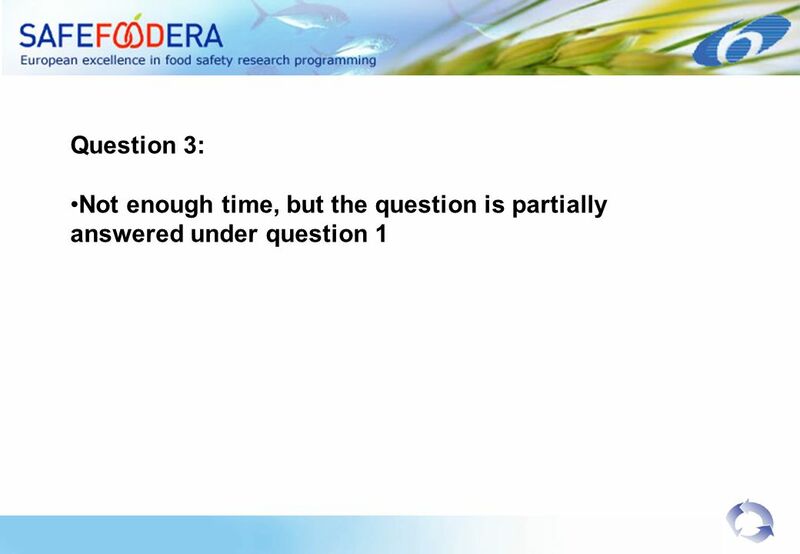 1.Options for co-operative initiatives on the advancement of food safety in the EU and world wide. Include the farmers. Links from food. 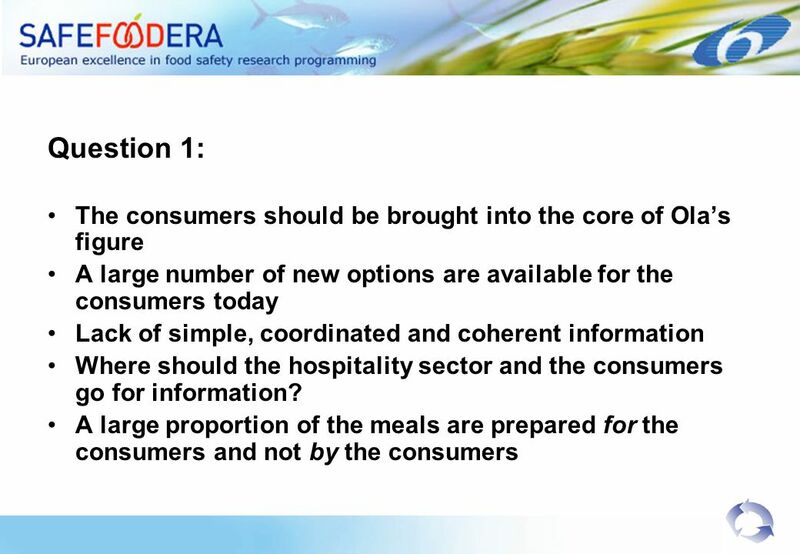 SAFEFOODERA Stakeholder Group meeting with Food Service Sector Ljubljana, February 2007 Objectives of the meeting. 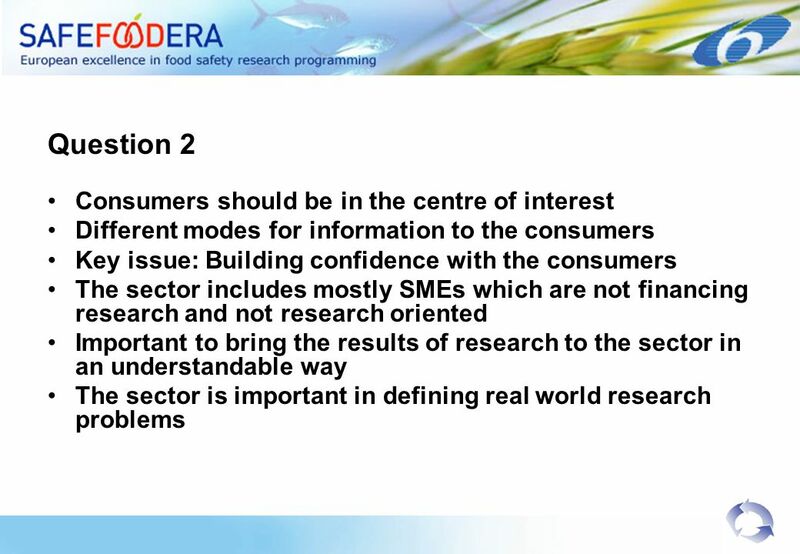 1 by Marco Vallini, HOTREC Policy Adviser Brief introduction to HOTREC Ljubljana, 8-9 February 2007 SAFEFOODERA meeting. McDonalds Europe SAFEFOODERA Ljubljana, Slovenia 8th February 2007 Dr. Bizhan pourkomailian. 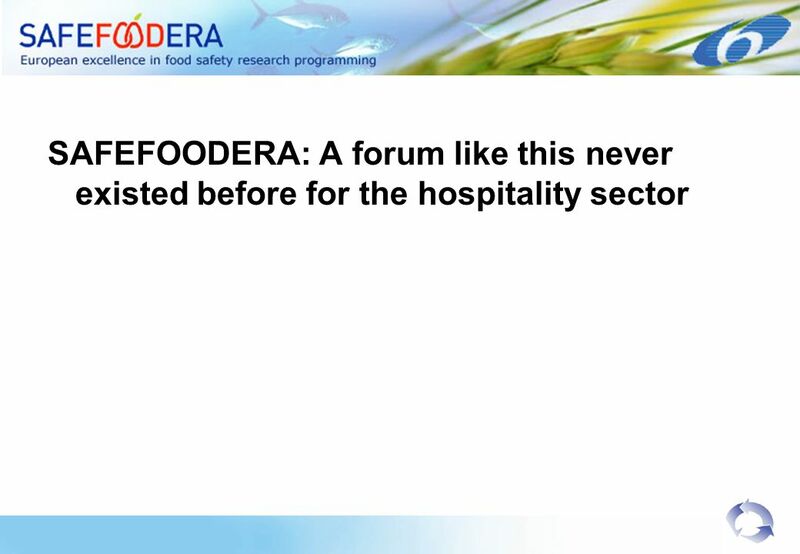 SAFEFOODERA Stakeholder Group Meeting with Retailers – Emerging Risks – Ljubljana, February 2007. Collecting and Analysing Data Chris Dayson Research Fellow Presentation to: Involve/CRESR Social Impact Masterclass 26th September 2013. 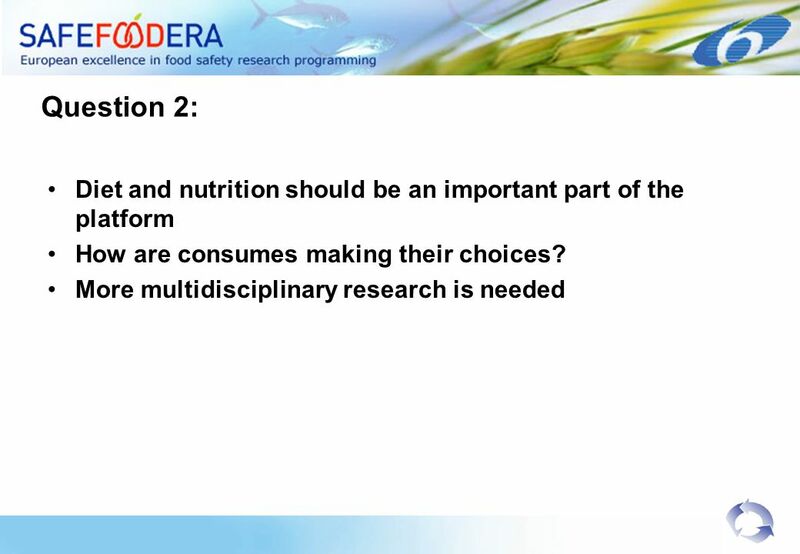 EFSA’s Mission and Priorities Bernhard Berger Head of the Advisory Forum and Scientific Cooperation Unit Conference “Importance of food additives today. A Financial Mechanism dedicated to the Mediterranean Radhi Meddeb President IPEMED. Public Perception Survey of Nutrition Labeling in Hong Kong 1 The University of Hong Kong Public Opinion Programme Karie Pang HKU POP Assistant Director. Creative Europe : a new approach to European cultural and creative funding Fabien Miclet European Music Office. EUROPEAN VENDING MARKET TRENDS VENDEXPO MOSCOW 2012 Catherine Piana Director General. Implementation of health research funding under H2020 SC 1- “Health, demographic change and wellbeing “ Elmar Nimmesgern PhD DG Research and Innovation. 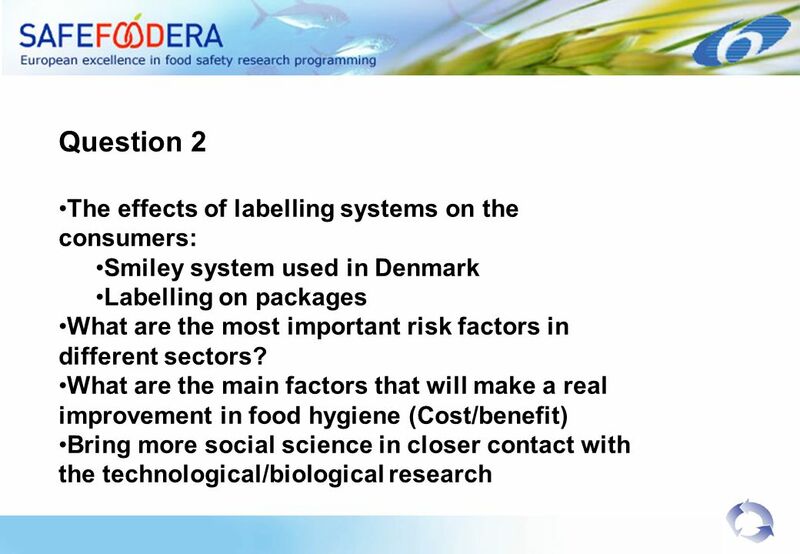 INFLUENCE OF CONSUMER PERCEPTION ON NEW FOOD PRODUCT DEVELOPMENT. Good Hygiene Practices along the coffee chain The Codex General Principles of Food Hygiene Module 2.3. European Vending Association Vending in Europe Today 1 Vending in Europe Today: Opportunities and Challenges Catherine Piana EVA Director-General. European Ministerial Conference on Counteracting Obesity Istanbul, Turkey November 2006 From The European Charter to the 2nd Action Plan for Food. Jacobs and Associates Growth, Flexibility and Protection: The Results of Regulatory Reform in OECD Countries Scott H. Jacobs Jacobs and Associates, An. This project has been funded with support from the European Commission. This publication reflects the views of its authors only, and the Commission cannot.